First off, it's not actually saying sorry that I have a problem with. In fact, I think that being able to apologize for something you've done is quite important and does have a place in conflict resolution. That being said, I do have a harder time with how often "say sorry!" seems to be used as a band-aid solution in early years settings. We've all seen it - for one reason or another, whether it be a stolen block or an accidental shove, a young student's eyes brim with tears. Perhaps all on their own, or maybe under the insistence of the adult in the room, the other student(s) involved muster up an apology. The original student usually mutters back "It's ok" - even though it's quite obvious it's not. Fighting off the tears that are still flowing, they go back to play because the "S word" usually indicates "this conflict is over" - despite how the students involved may still be feeling. In my own practice, I've witnessed this approach come off almost like a rehearsed script that students quickly learn and churn out almost automatically. An incident arises and the students simply go through the motions before going about their days - "I'm sorry". "It's ok". But are they really sorry? And is it really ok? With the quick "sorry" approach, I argue that we're robbing all parties involved from a wealth of valuable learning - naming their feelings, explaining the conflict in their own words, active listening, thinking and responding, identifying strategies for next steps. Yes, "saying sorry" is quick and often easy - but is it really effective, useful, or meaningful as a strategy? We know it's important to teach our students academic skills, but I feel that conflict resolution skills are just as important in life - and it's our responsibility as educators to make sure we're not robbing students of these opportunities. One of my personal goals this year as an educator was to equip my students with the ability to move beyond sorry and explore their emerging conflict resolution skills in a way that honoured them and allowed them ownership of their feelings. With that in mind, our room now features an additional learning centre, one that I think is just as important as our math, writing, reading, and science areas - The Talk It Out Table. It's exactly what it sounds like. A space for two, or more, students to sit face to face and discuss their feelings about conflicts that may arise in our learning community. I feel that this sort of conversation and connection is deeply important and often skimmed over by the aforementioned "say sorry" approach. It was a bit of a gamble, I wasn't entirely sure how students would respond to a learning centre such as this, or even if they'd utilize it. 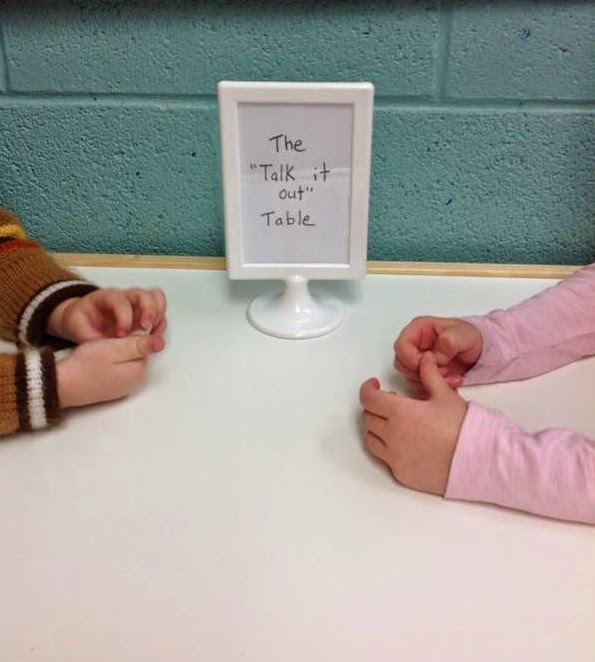 However, I quickly saw how powerful our Talk It Out Table really could be, as students, most often without my prompting, asked each other to meet them there. Often I too go to the table, but work really really hard at not stepping in unless it's needed - I think it's more important to allow students to see themselves as capable at solving their own problems (while also knowing an adult is there to help should it come to that). It's been neat to sit back and simply observe. I've been continuously wowed at how eloquently and respectfully students can talk about conflicts when actually given the chance. Because there's no required script or steps for them to go through, students naturally move on their own to what they need to feel better and don't tend to leave the table until true resolution has taken place and all parties involved feel it. I don't think any of the growth I've seen so far this year with regards to students' emotional vocabulary, self regulation, and mutual respect would have been possible if I simply rushed to insist everyone mutters out an apology as a means of resolving conflict. Yes, apologies are an important part of conflict resolution - but they're not the only part. With this blog post I wanted to share how we've been moving beyond sorry in our learning community, and to hopefully inspire you to examine your own approach to this idea in your classroom.